In May 2013, Tiny Islands cruised into all yer favourite bookshops. It’s packed with sixty bijou British islands awaiting exploration and is the definitive book on the nation’s accessible pockets of water-surrounded loveliness. You can find some words about it here and pick up a copy at the same time for cheapity cheap. Reviews suggest that you won’t regret it. As a taster, here’s a little info about one of the islands featured in the book: Ynys Gifftan in Gwynedd. A tiny bit of Ynys Gifftan. 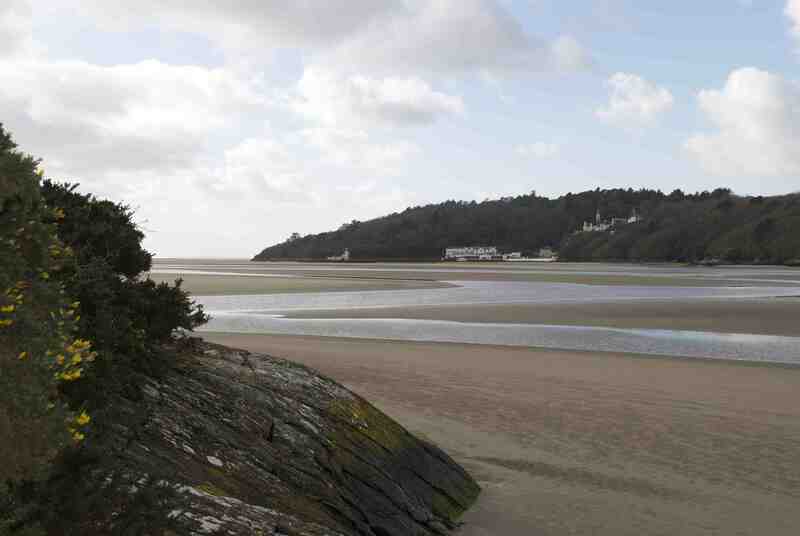 Portmeirion is over the far side of the sands. Like a brown egg half buried in the sands of the Afon Dwyryd, Ynys Gifftan is fortunate enough to command views of Portmeirion and the Irish Sea in one direction and Snowdonia (and, hey, Snowdon itself when the mists clear) in the other. A gift from Queen Anne to Lord Harlech (hence its name, which means Anne’s Gift Island) in the early 18th century, the isle has but one residence, a stone-built cottage. It’s currently unoccupied and was, sadly, vandalised a few years ago, but if you wish to do it up a bit and live there, do apply to the island’s owner, the 6th Baron Harlech, who I’m sure would be more than happy to lease you Ynys Gifftan (under the terms of the gift he’s not allowed to sell you the island – a canny woman, Queen Anne). The sands in the picture above are where the ‘Rover’ scenes from cult 60s television series The Prisoner were shot. Which means, of course, that the buildings you can just make out on the far shore are those of Portmeirion, the Italianate fantasy village built by Clough Williams-Ellis. In other news, a devastating tsunami swept up the estuary in 1927 causing considerable damage to the local village of Talsarnau and the railway lines that used to run up this stretch of coast (there’s just the one left now). Fans of the 1927 Welsh Tsunami can read about it in my book Tiny Stations (which features Talsarnau) as well as Tiny Islands. 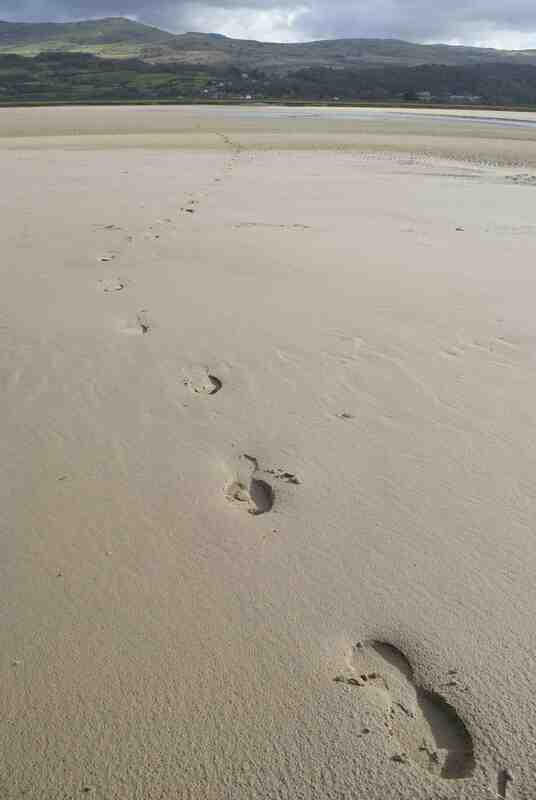 Meanwhile, for fans of footprints, here are some of mine, trailing across the sands towards Talsarnau, the village from where access to the island is possible at low tide if you don’t mind getting your legs wet. You’ll notice that there is only one set of footprints. That’s because Jesus and I hopped the entire way across. we have met on your trip to Havergate Island in the Summer. and started searching the web to find news about any progress on the book you mentioned and luckily found this blog. I hope you have taken home some good memories from our brilliant RSPB reserve? If you need any more infos about Havergate Island, please don’t hesitat to ask. We have been quite busy on our trips in 2012 and plan to introduce some additional exciting new event formats on Havergate Island in 2013, if we get the necessary funding approved in January. Just thumbed through personal copy of your book on a recent visit to Ivy Grange – extremely enjoyable (both visit and book!) and will look out for it! Glad you enjoyed both book and yurts (it is lovely up there, isn’t it?). Available in all good (and occasional mediocre) bookshops. Dixe would you like to join Jaffé and Neale bookshop at the Rapha Tempest Festival during the Tour de France ? http://www.raphatempest.cc/ should be fun !!! We know you love cycling and camping, so do 20,000 other people. That sounds great and thanks for inviting me along but I’ll be setting off on the research journey for my next book on 4th July so Yorkshire will have to do without me, I’m afraid. Anyone visiting Portmerion and interested in fast tides, should arm themselves with tide tables and venture up into the woods above the village just before the tide is due in. The sands in your picture above are so flat that the water comes in as a wave, rather like the Severn bore. Its quite a scary sight from a viewpoint on the top of the hill. One minute your looking at acres of beautiful sand, then you hear the water coming, and in what seems just like a few seconds, the whole area is flooded.